You've seen what HBO and AMC's Mad Men have to offer, so here's more Emmy Award Consideration billboard support from the likes of Comedy Central, Amazon, NBC, ABC, Netflix and for more AMC shows. In addition to marketing and advertising opportunities from winning, there's also the bragging rights of having the channel or network with the most critically-acclaimed shows, which can help attract new and established talent for future collaborations. 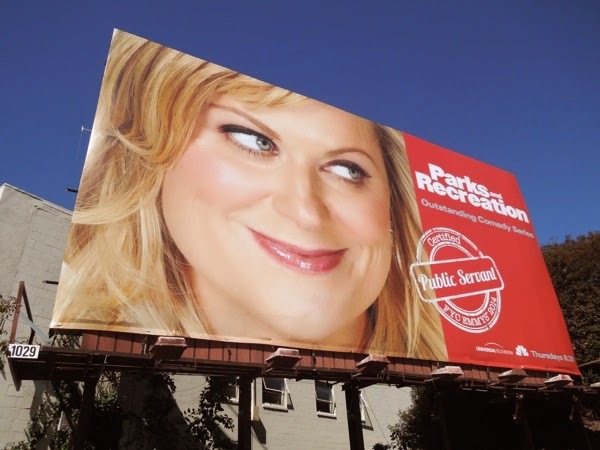 NBC started their Emmy campaign early this year with this cheeky Amy Poehler Parks and Recreation 'Certified Public Servant' billboard snapped on April 7 along Sunset Boulevard (plus Daily Billboard also drove past a creative for NBC's The Blacklist but was unable to stop and photograph at the time). 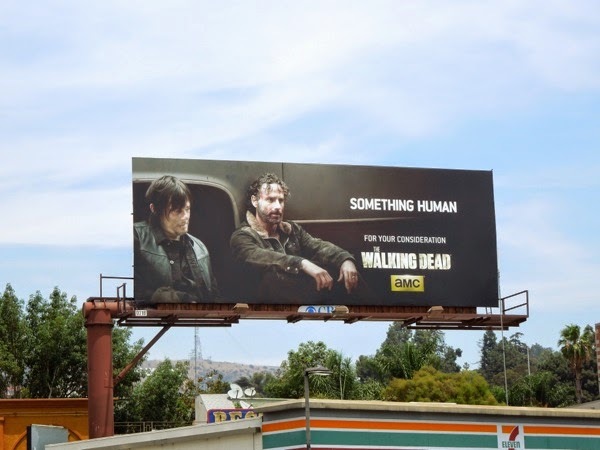 Daily Billboard is also keeping everything crossed for AMC's The Walking Dead this year, as there really is 'Something Human' about the show. Snubbed in the past for its horror genre credentials, this ratings winning cable show is less about the gory zombie apocalypse and more about the humanity and struggle of surviving in the aftermath. 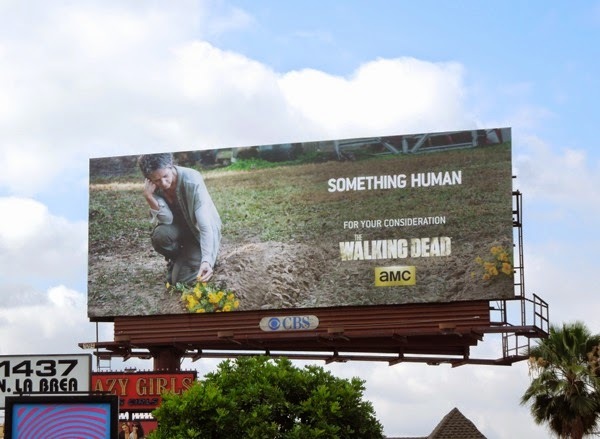 These character driven billboards featuring pivotal moments from season four showcasing various survivors, most poignantly 'Carol' at a graveside after another of the series stunning, unconventional moments, are surely worthy of a few Best Drama Emmy nominations this season. 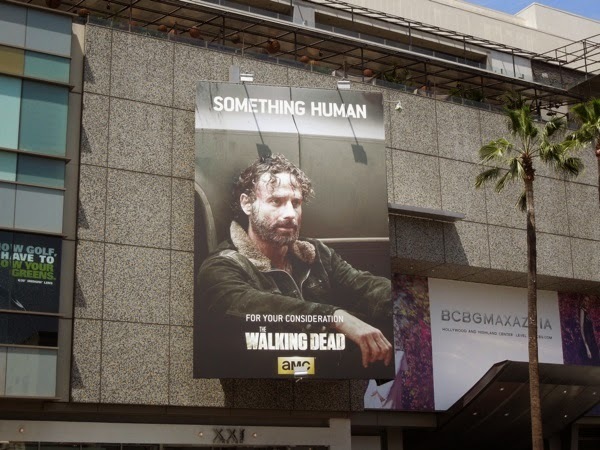 The 'Rick Grimes' ad creative was spotted along Hollywood Boulevard on May 19 (and the version with 'Daryl' a week or so later along Cahuenga Boulevard), the 'Carol' billboard on May 21 along La Brea Avenue and the prison scene between a sick 'Glenn' and 'Hershel' was snapped along Vine Street on May 24, 2014. 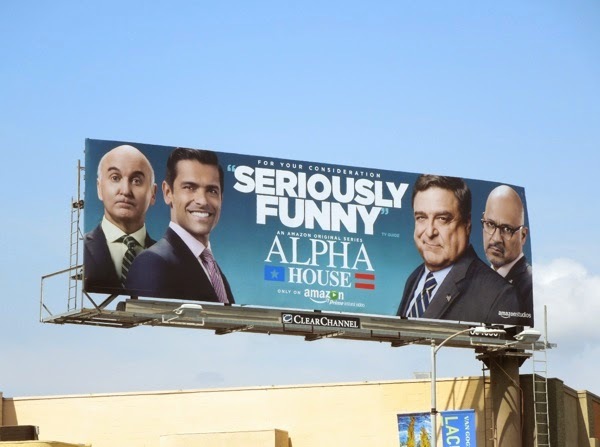 From deadly serious to 'seriously funny' and even though Daily Billboard didn't see any outdoor ads supporting the launch of Amazon Studio's first original TV series, Alpha House, it looks the streaming service is going all out to support the show and its cast. 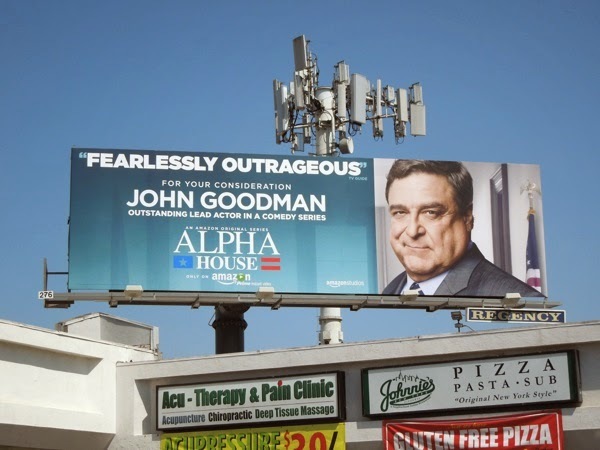 Will this 'fearlessly outrageous' billboard for John Goodman be able to garner some votes for his portrayal as a U.S. 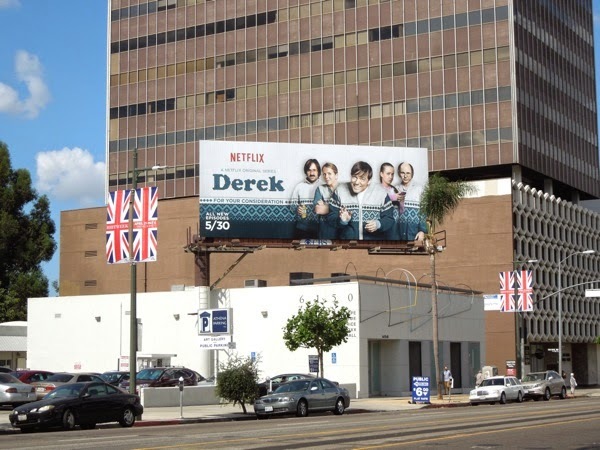 Senator sharing a house with three other politicians in Washington D.C.
From one new content provider to another, and Netflix uses its second season billboard for Ricky Gervais comedy Derek to also help campaign for Emmy nominations. 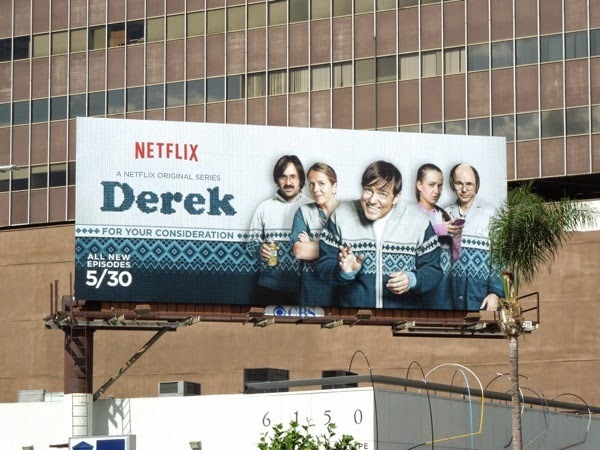 This sophomore season billboard was spotted on May 6 along Wilshire Boulevard and be sure to check out the season one Derek billboard from which this matching cardigan ad creative is adapted. Meanwhile Netflix's hit drama House of Cards is back in the skies of L.A. along Beverly Boulevard on May 28 to get all the votes it can muster for the scheming political series, especially as both Kevin Spacey and Robin Wright missed out last year after being nominated in their respective Lead Actor categories. Plus another critically-acclaimed Netflix series out to steal a few nominations with its amazing ensemble cast set in a women's prison is Orange is the New Black. 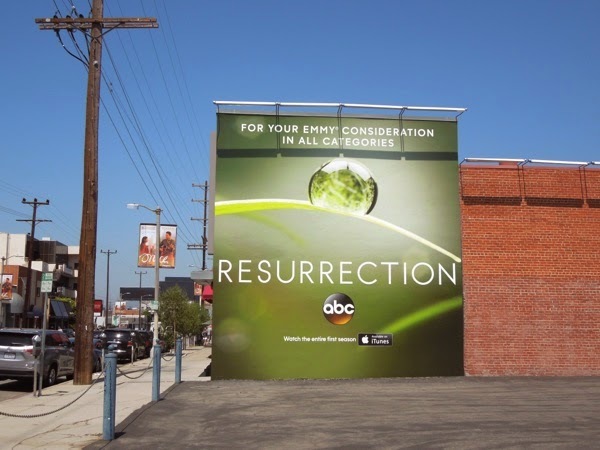 ABC Studios is showing some support for its new fantasy drama, Resurrection, about the return of deceased loved ones to a town in Arcadia, Missouri. As a bonus here's the 'Did I really die?' 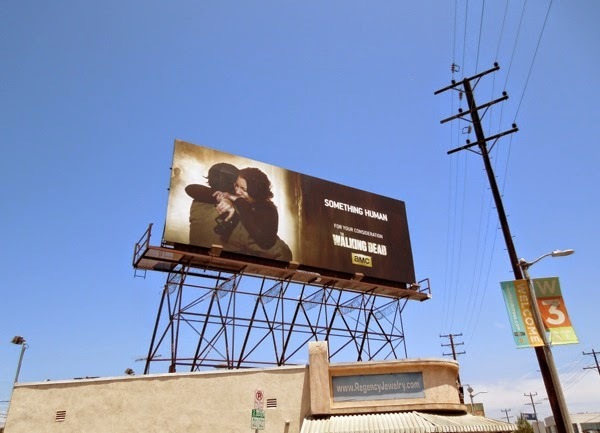 billboard which teased the series in February earlier this year and the Emmy Consideration billboards that were spotted near Sunset & Vine in Hollywood on May 19, 2014. 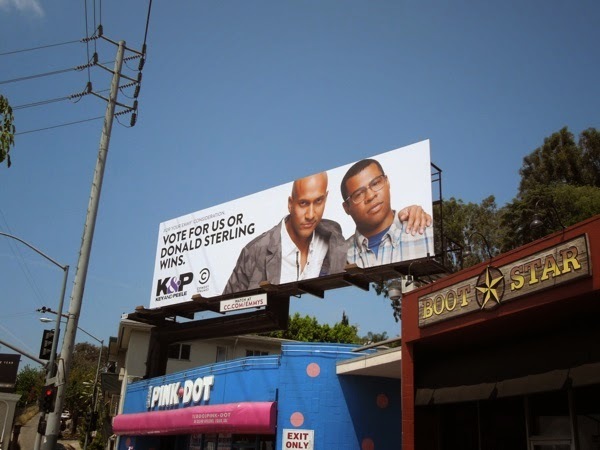 One of the funniest Emmy Consideration billboards this month has to be this topical 'Vote for us of Donald Sterling wins' creative for Comedy Central's Key & Peele sketch show. 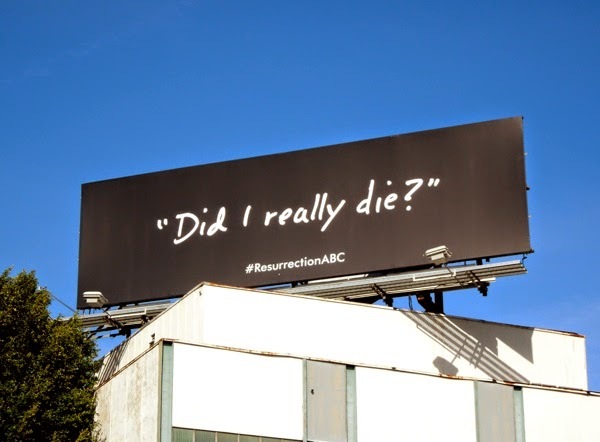 This tongue-in-cheek billboard which capitalises on the racist remarks made by the owner of the L.A. Clippers at the end of April and was snapped along Sunset Boulevard on May 19, 2014. 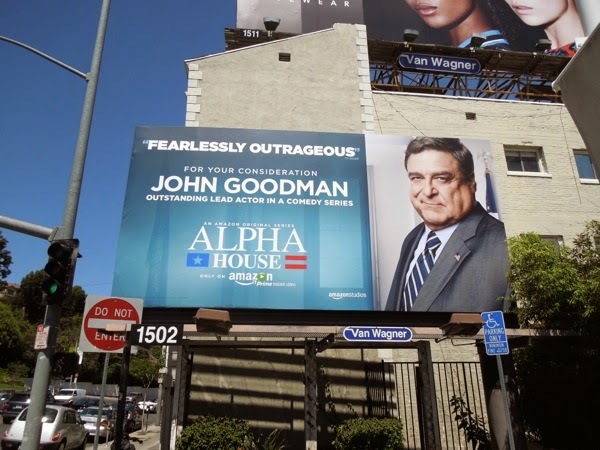 The smaller 'John Goodman' Alpha House creative was snapped along L.A.'s Sunset Strip on May 12 and a larger landscape version for the actor was spied along Olympic Boulevard on May 21, 2014, whilst the 'Seriously Funny' wider cast creative was snapped the same day along Santa Monica Boulevard also in West L.A. 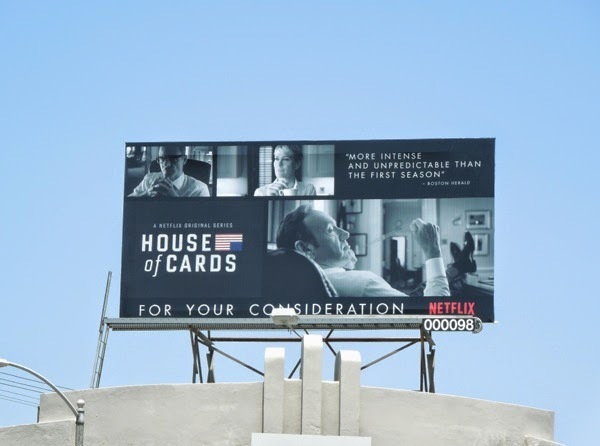 If you like these comedy and drama Emmy billboards, be sure to also take a look at this year's HBO Emmy Consideration billboard campaign and the clever vintage-style Mad Men Emmy Consideration billboards. 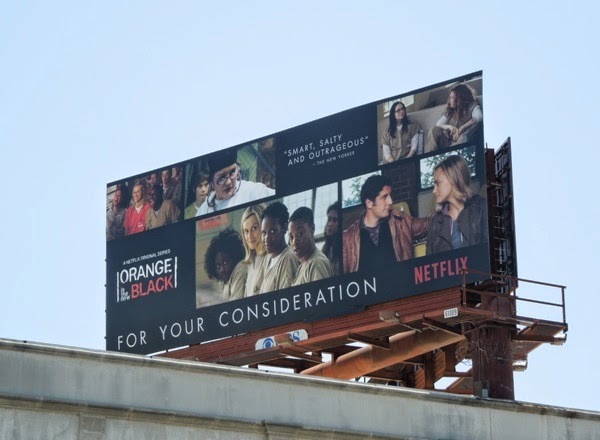 Be sure to also check out these 2013 Emmy Consideration billboards for the likes of AMC, Showtime, HBO, History and Netflix from last year and more Emmy Consideration billboards from 2012. 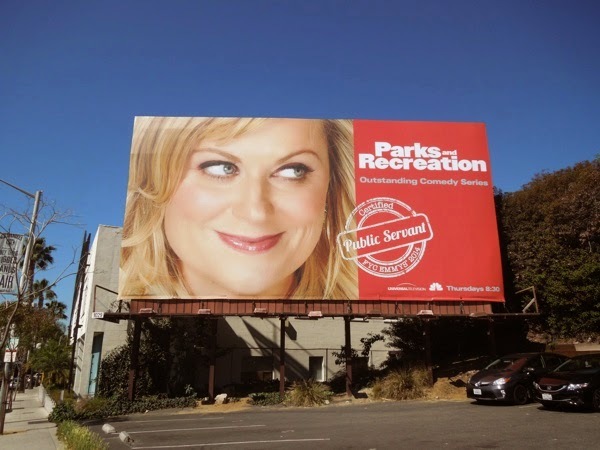 After seeing all these TV show billboards, who would you vote for? 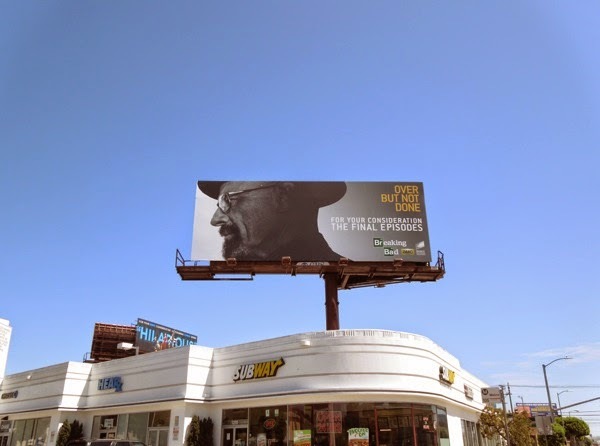 No doubt more Emmy billboards will follow in the weeks to come, so stay tuned to Daily Billboard for all the latest finds. 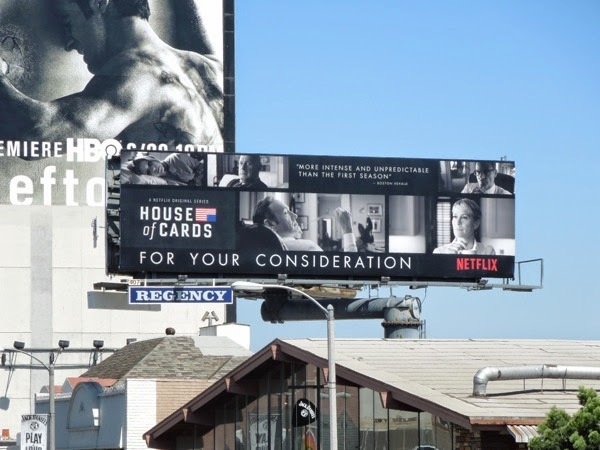 UPDATED: Just as predicted, even more Emmy Consideration billboards have already started to appear in the skies of L.A., like this full-size landscape billboard for House of Cards sophomore season spotted along the Sunset Strip on May 30. 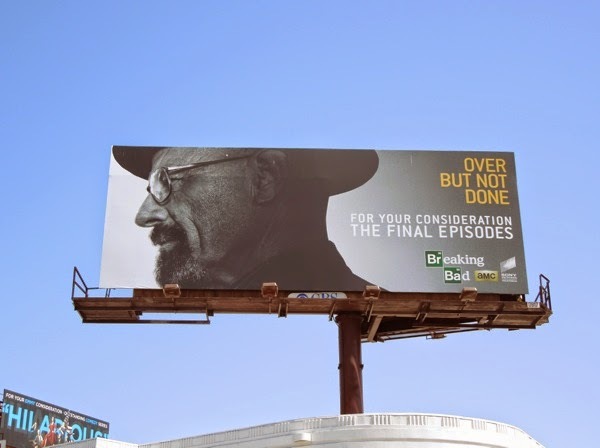 And you just knew that AMC wouldn't let Breaking Bad disappear with a whimper, more of a bang, as it's apparently 'over but not done' for 'Walter White' and the show's final episodes. Anna Gunn took home the Outstanding Supporting Actress Emmy for her role as 'Skyler White' last year, but will the rest of the cast triumph in their swan song awards season (especially as Bryan Cranston scored the Best Actor in a Drama Series Golden Globe earlier this year). 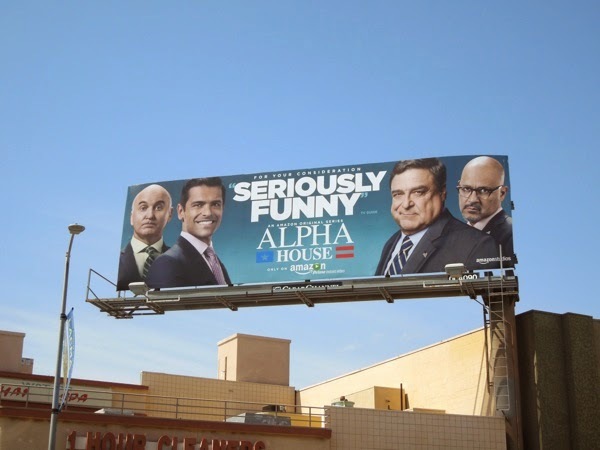 This Emmy Consideration billboard for the show was snapped along La Cienega Boulevard on may 30, 2014. UPDATED: And following in the footsteps of Key & Peele's 'Donald Sterling' creative, those ladies from Comedy Central's Broad City have their own unique spin on grabbing attention for Emmy Consideration. 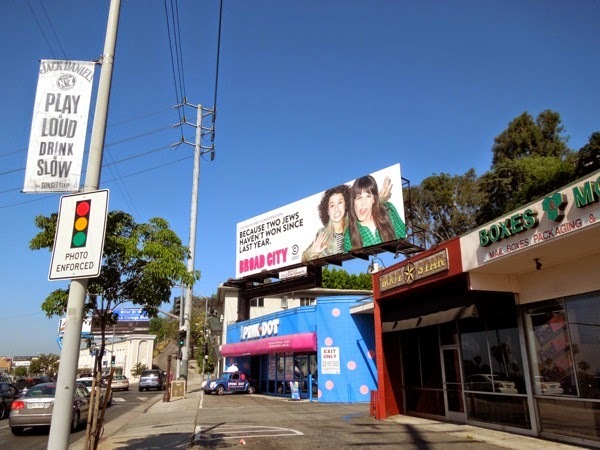 This tongue-in-cheek 'Because two Jews haven't won since last year' billboard was spied along the Sunset Strip on Jun 2, 2014. 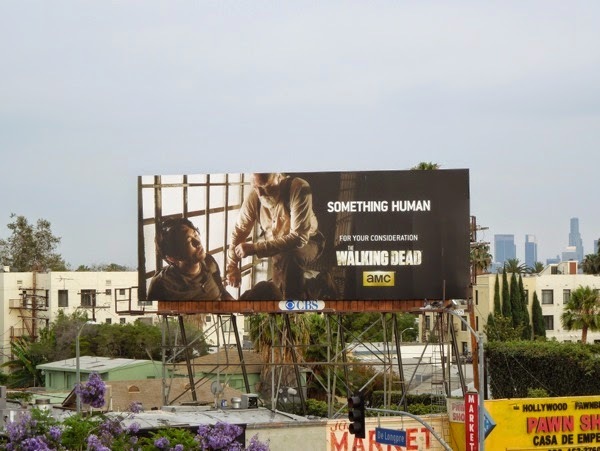 Plus here's another creative in the 'Something Human' Emmy ad campaign for The Walking Dead, featuring everyone's favourite couple of the zombie apocalypse reunited, 'Glenn' and 'Maggie', spotted along 3rd Street on June 2, 2014. 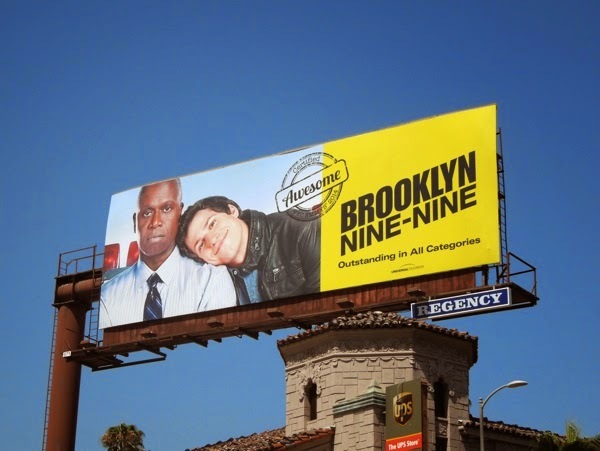 UPDATED: Now here's another 'awesome' Emmy billboard that pops out at you with its vivid yellow colour for Andy Samberg's cop sitcom, Brooklyn Nine-Nine. 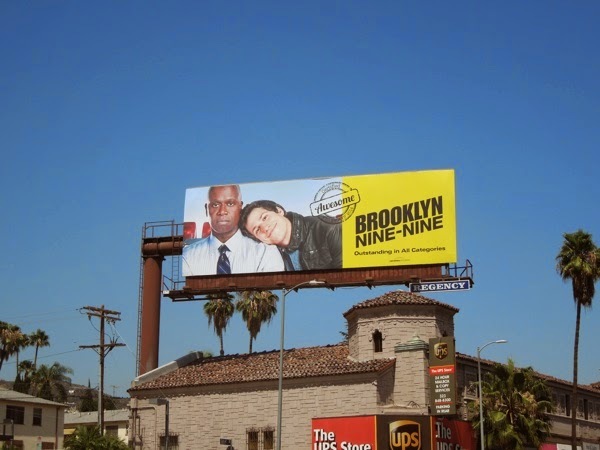 This vibrant creative, also featuring Andre Braugher as a very put upon police captain, was snapped along Sunset Boulevard at Crescent Heights Boulevard on June 5, 2014. Can Andy Samberg nab an Emmy Award in the same way he took home the Golden Globe for Best Comedy Actor earlier this year. 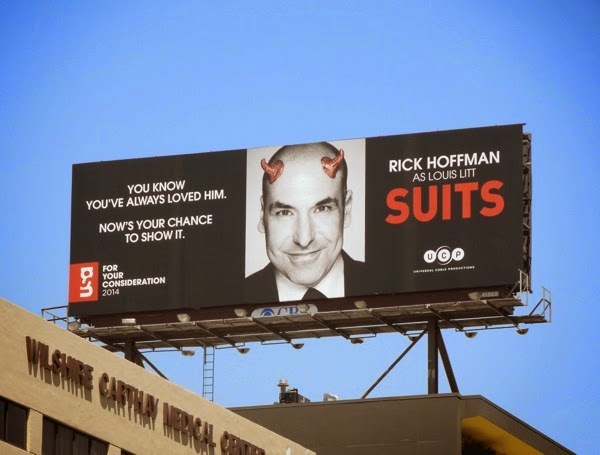 UPDATED: In addition here's an Emmy Consideration billboard for the Rick Hoffman who plays the devilish 'Loius Litt' in USA Networks Suits, spied high above Wilshire Boulevard on June 9, 2014. 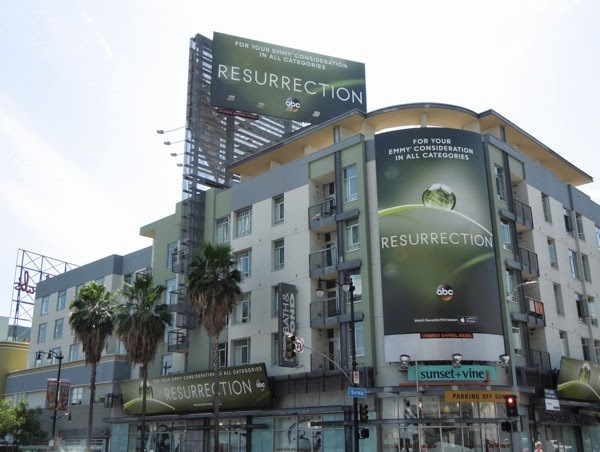 And here's a much brighter creative for ABC's Resurrection spied along L.A.'s 3rd Street on June 13, 2014. 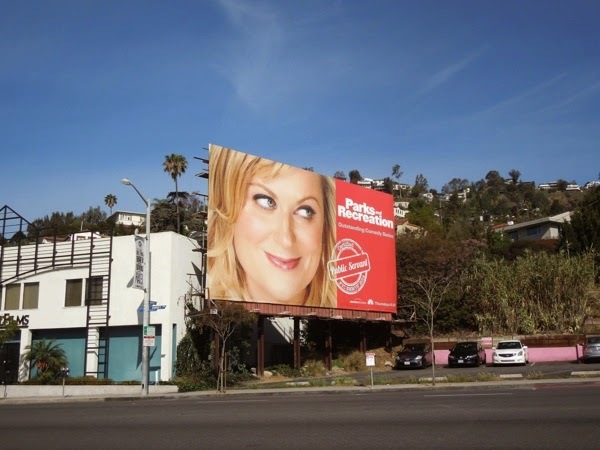 UPDATED: Following on from the hilarious Key & Peele and Broad City Emmy Consideration billboards, here's another Emmy ad from Comedy Central for Inside Amy Schumer spied on June 16, 2014 in the same location along the Sunset Strip. This billboard is much more of a traditional quote-based creative, which doesn't pack the same punch as the first two executions. 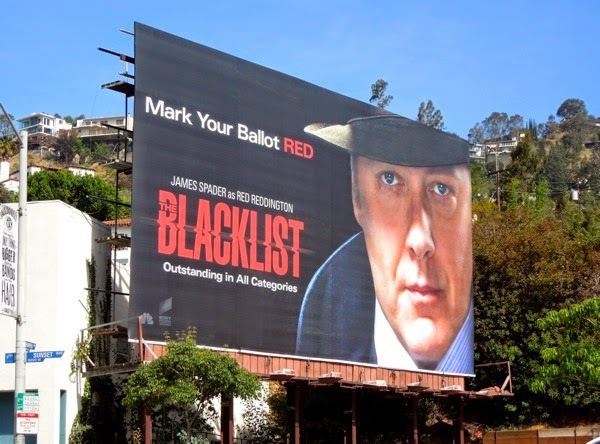 UPDATED: This clever 'Mark your ballot Red' Emmy Consideration billboard for James Spader as the mysterious 'Red Reddington' in The Blacklist was spied along the Sunset Strip on June 21, 2014.